When I was young I used to think that world literature would be full of fabulous tales of magic and adventure from the Middle Ages in the form of Romances and tales of chivalry. I read as many as I could find in English translations, usually done some time in the 19th century, and hopelessly turgid in style and pacing. And I thought there must be more in other languages if I could only find and read them. Then Lin Carter told me about Amadis of Gaul, and finding an edition of it became a personal quest. Well, I found one, in Spanish, in the University of Arizona library stacks while I was Library School student there, getting my Master’s degree. I read as much of it as I could, and I translated some of it. Going through some old papers, I found this translated chapter. Maybe I thought I could turn it into a short story. So the following translation is kind of crude, but I bet I could rewrite it into something more interesting if I tried. Eventually I found a translation of the whole book by the English poet Robert Southey. Reading it pretty much killed my desire to do anything with Amadis of Gaul. Who is Amadis of Gaul? Let wikipedia tell you more about him. http://en.wikipedia.org/wiki/Amadis_of_Gaul. It appears that someone named Sue Burke has also rediscovered the Amadis of Gaul story, and has been translating it into (mostly) modern English for the last two years. She has finished Book 1 (of 4), and is offering it for sale. 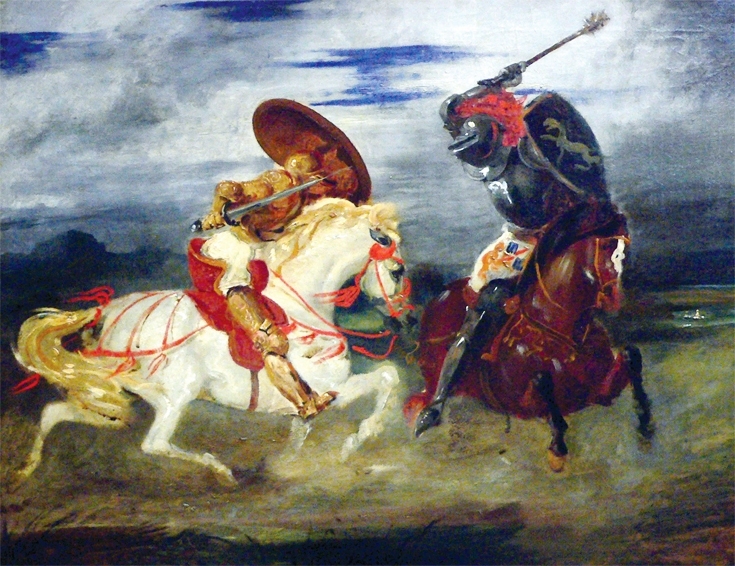 If your interest has been aroused by this, you can start your own researches into the tale of a knight as famous as Lancelot at this location: http://amadisofgaul.blogspot.com/. I took this painting from one of her blogs, as it was far superior to the other pictures of Amadis that I found on the internet. Amadis, of course, would be riding the white horse. He was always the pure-hearted good guy. “I advise you to go back where you came from,” the knight answered. They lowered their lances and struck each other’s shields The knight fell to earth. Amadis, who was still mounted, was about to hit him again, but the knight begged for mercy. Amadis approached him to take the oath, but the other, who had sword in hand, struck Amadis’s horse and made it fall. Amadis sprang free from the falling horse, drew his sword, ran at the man, and struck him on the helmet, splitting the man’s head to the nostrils. The knight fell to the grass. Still angry, Amadis then cut his head off. “Yes, I desire it,” answered the stranger. He took her by the arm and lifted her up behind him on his horse, and then spurred it to a gallop. She realized her mistake and screamed, but he galloped on. The screams woke Amadis. He put on his helm, took shield and lance, and galloped in the direction where the knight had vanished. He soon found himself among some thick trees, far from the road, and although he was the most suffering knight in the world, he was very angry with himself. He went on part of the day through the country until he finally heard a horn blowing. Attracted by the noise, he arrived at a fair castle situated on a small hill. The wall was high, the towers strong, and the gate well shut. The guards on the parapet said they had seen no damsel. Amadis circled the castle, and found on the other side a small door that was open. The kidnapper was there inside the door. Amadis challenged him to come out, but the knight said he would not, and if Amadis wanted to enter, he would have to submit to the custom of the castle, and that he should return on the following day. The knight closed the gate. Amadis and Gandalin made camp and waited under some nearby trees. “You buy it dearly,” said Amadis. “More than anything, I want to recover the damsel that I had if I can. Amadis faced three more knights. They were all well armed, well mounted, and fair to see. They called upon him to yield himself prisoner or to accept the commands of the lady of the castle. The lady asked what he demanded, and he told her he wanted the damsel that had been taken from him. The lady, whose name was Grovenesa, and who loved Angriote de Estrevaus, wanted to avoid the battle. The knight was Gasinan, her uncle. But, he didn’t want to give up the damsel. They brought him a big horse. Amadis mounted and took his weapons. The ladies went aside. The knights encountered at full gallop with lowered lances. The lances broke on the shields, and they collided. Gasinan fell off his horse. He arose, drew his sword, and climbed on a pillar of stone that was in the middle of the courtyard. Amadis approached, and then Gasinan wounded Amadis’s horse on the face. Amadis, with great rage, wanted to strike with all his might, but he missed his target and struck the pillar instead. That broke his sword into three pieces. Amadis saw himself in danger of death, and dismounted as quickly as he could. “Yield the damsel to me or you die,’ said Gasinan. The lady swore, and then Amadis left the knight. The lady made the stolen damsel come forward. She fell on her knees before Amadis.